Just over a month ago, Ars Technica reported that many users had noticed a significant decrease in battery life on their notebooks after upgrading from OS X Lion to OS X Mountain Lion. In its own testing, Ars Technica saw a 38% decrease in battery life following the upgrade. 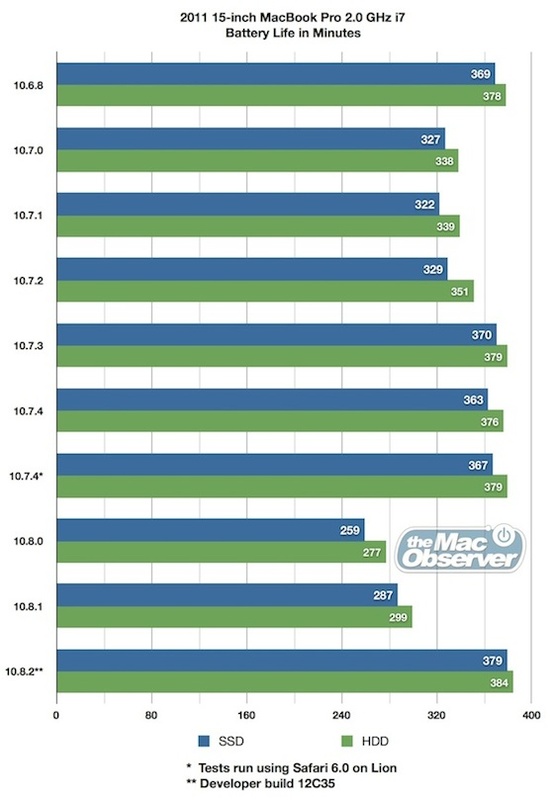 The Mac Observer followed up with more extensive testing showing a similar 33% drop in battery life on a test machine following the upgrade to OS X Mountain Lion, and also finding that OS X 10.8.1 improved battery life over the original Mountain Lion release. The improvements did not, however, bring battery life back up to the levels seen under OS X Lion. With OS X 10.8.2 now well into testing, The Mac Observer has performed its most complete set of tests yet, not only testing the effect of moving from OS X 10.8.1 to Build 12C35 of OS X 10.8.2 on battery life, but also looking at upgrades from OS X Snow Leopard to OS X Lion. Of most immediate impact, The Mac Observer's study shows that the testing build of OS X 10.8.2 completely restores battery life to OS X Lion levels, yielding approximately 380 minutes of power under the testing protocol, compared to 260-275 minutes under OS 10.8.0 and 280-300 minutes under OS X 10.8.1. Just as we saw in our previous tests, the upgrade to 10.8 Mountain Lion decreased battery life significantly, by about 1 hour and 45 minutes, or 30 percent. The upgrade to 10.8.1 restored about 30 minutes of battery life for our MacBook Pro, an improvement for sure, but not nearly enough to regain lost ground. The big change came with 10.8.2, which is still undergoing developer testing. Using the latest build, 12C35, we saw a tremendous increase in battery life, to the point where running time was a few minutes longer than even that of 10.6.8. In addition, the study shows that users experienced a similar but smaller effect on battery life with the introduction of OS X Lion, an issue that was not fully resolved until the release of OS X 10.7.3 over six months after the public debut of OS X Lion. Not all notebook users have experienced significant battery life reductions under OS X Mountain Lion, and thus it is unclear exactly what the root cause of the issue is. But for those who have been suffering from the problem, it seems that OS X 10.8.2 may deliver a resolution that will restore full battery life to their machines. Maybe I'm missing something here, but aren't SSDs supposed to increase battery life compared to HDDs? And I'm not talking about the ~5 minutes differences here, from what I've read SSDs were supposed to significantly increase battery life. Hi guys; I performed the tests for The Mac Observer. As I explained in the article, we were also confused as to why the HDD was getting better battery life than the SSD. We looked into it and discovered that our hard drive, a Western Digital Scorpio Blue, is extremely power efficient, using .59 watts at idle and 1.4 watts while active. This is very low for a mechanical hard drive and our high performance Vertex SSD used more power: 1.3 watts idle, 2.5 watts active. Some low speed, energy efficient HDDs have closed the gap in power consumption with SSDs, but YMMV. Apple are you listening. Far too many products - hardware and software are being released that clearly need months more development testing. You mojo will be lost sooner rather than later if this continues. Fair enough, but I think Apple might argue that they need volumes of data from real-world use to really sniff out and resolve these types of issues. Looping an HD video to see how long a battery will last is vastly different than having thousands of data points to see where the bottlenecks are. Not defending or apologizing for Apple. I just think there is a little more to the story. Um... but the article is about an increase in battery life in the near future, brought to you by an update. No decrease is mentioned. Hopefully fewer 'Ahh my battery is dying'/'battery not lasting as long as advertised' threads.